Stratman serves up a refined and masterfully collated suite of works. Bound together by an exploration of landscape, rendered in metals, the show wears its content on its sleeve. This is nature, mined, refined, flattened, hammered and constructed. And set among a handful of the works is the standing, contemplative figure of the lone human. Subsumed and dwarfed by the environment in which it sits, the figure is also resolute and, importantly, crafted from the very materials that make up its surroundings. Everything in the natural order is but rocks upturned, unearthed, churned out and refined. Rocks begat soil begat tree begat cloud begat human. 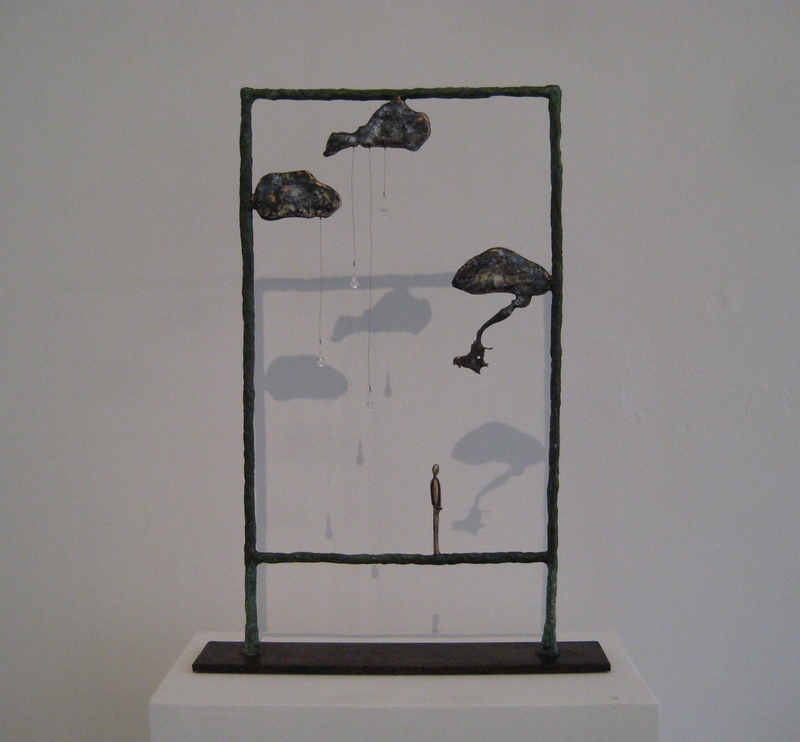 The works are sculptural in nature, with bronzes and wall-mounted images made of aluminium, pewter, wood and steel. These wall works are like paintings made with crafted inner-earth materials instead of oils and powder, and in a way speak more directly to ideas of landscape. The more three-dimensional sculptures retain a surrealist edge, harbingers of the fantastical. Hands grow from the ground, reaching toward the sun with offerings of organic growth, limbs reflecting the roots that tie them to the earth. In the smaller space of Gallery 2, Gilbee presents artefacts collected by the artist in the form of discarded notes and papers. Cast up on the walls in a sea of rich black universal void, the notes become floating asteroids of granite and marble. Encircling the space around the viewer generating a heavy silence and solemn atmosphere. Fluctuating between abstraction and documented figuration, between minimalist graphic and detailed forensics, the works constantly walk a tightrope of tension and are all the more potent for it. 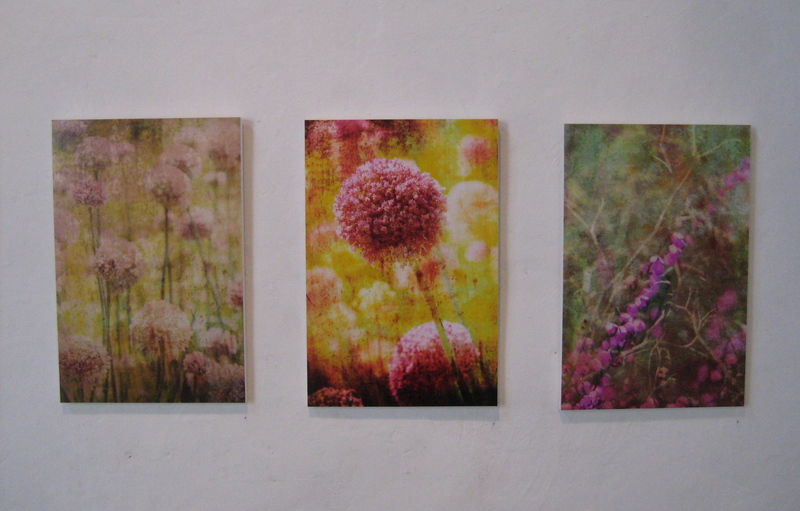 Parker’s photographs in the Project Space draw on the cyclical processes of plant growth. Flowers, blossoms and berries are the subject matter coupled with the particularity of the process for printing, a scratchy, washed out nostalgia, reinforcing the ultimate entropic decline of these temporal declarations of beauty. The nature of photography freezing selected moments plays against itself in the artificial sentiment of sunbleached and worn history. Sequenced into colour variations along rows of equally sized images, they’re almost tonal phrases, like notes running along sheet music. And while the works are clearly individual bodies of works from individual artists with individual approaches, there’s a happy interrelationship between the three gallery spaces. There’s this sense of capturing the fragile and ethereal passage of natural time and rendering it into monument for deeper contemplation. For Stratman it’s frozen clouds of steel, suspended glass rain drops and isolated, still figures – wrought from the hard materials of the earth; for Gilbee it’s the x-ray snapshot of drifting paper notes about events long passed; and for Parker it’s the delicate beauty of a blossom and botanic growth, etched for posterity into colour and composition. It’s the ever bubbling emergence of natural forms, of momentary elements, filtered through a technological conduit and provided for meditative pleasure. Exhibition runs until 4 Dec. Tags: Deborah Parker, Jennyfer Stratman, review, Stockroom Gallery, Tara Gilbee. Bookmark the permalink.